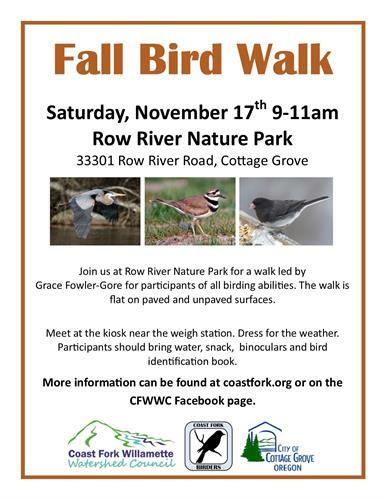 Join us at Row River Nature Park for a walk led by Grace Fowler-Gore for participants of all birding abilities. The walk is flat on paved and unpaved surfaces. Meet at the kiosk near the weigh station. Dress for the weather. Participants should bring water, snack, binoculars and bird identification book. More information can be found at coastfork.org or on the CFWWC Facebook page.